My first book, although no longer in print, is one that holds special meaning for me. During World War II my father was stationed in India and China, and on one furlough he traveled to the Kingdom of Sikkim where he went hiking in the high Himalayas. I grew up hearing about my father's stories and often sat rapt in front of the slide screen absorbing the images of Asia. In 1974, when he was 65, my dad and I trekked to near Everest Base Camp. I, too, fell in love with the Himalayas. Six years later, my husband, Jon, and I spent seven weeks trekking throughout Nepal and had the pleasure of meeting Sir Edmund Hillary on one of his expeditions to the Khumbu Region. In 1992 my dad had a chance to return to Sikkim, and my brother and I joined him. We hiked for five days in the rhododendron forests near the base of Mt. Kanchenjunga through torrential downpours, leech-infested trails, but flanked by the glorious scenery of the snow‑capped peaks. Together we climbed a small peak at 14,400 feet to place stones on the mani wall under the prayer flags. Dad was 82. Two years later, shortly after my father's death, I proposed a picture book biography of Sir Edmund Hillary, the first man to climb Mt. Everest. Although it was an amazing feat to conquer the world's highest mountain, it is even more impressive that Sir Edmund dedicated his life to improving the lives of the Sherpa people who inhabit the region around Everest. 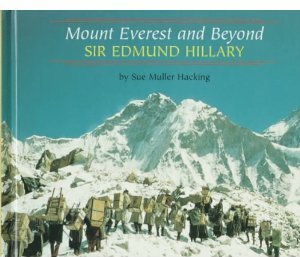 The book, Mount Everest and Beyond: Sir Edmund Hillary tells of the climb but concentrates on Hillary's relationship with the Sherpas, and the many schools, bridges, and hospitals he has built for them. About half the photographs in the book were taken by Jon and me in 1974, 1980, and 1992. The historical photos came from archives in England and New Zealand. I was honored to be able to meet and interview Sir Edmund and his wife in San Francisco the year before the book was released. The book may be about Sir Edmund Hillary, but to me it will always be a loving reminder of my own father and his love of the Himalayas. "Grade 3-6. The climbing of Mount Everest is only a small part of the story told in this simple and well-written biography. Much more basic to understanding Hillary ... is his attraction to the Himalayas and his fondness for the people who live there. The text describes how this son of a New Zealand beekeeper became interested in mountain climbing, stressing his friendship with the Sherpa guides who accompanied him on various expeditions. Particularly eloquent is the description of his relationship with Tenzing Norgay, the Sherpa who joined him in the final push to Everest's summit. Also covered are Hillary's later years, including the tragic loss of his first wife and a daughter in a plane crash, and his ongoing efforts to improve living conditions for the Sherpas through the building of schools and hospitals. Both the introduction, written by Hillary himself, and the final passages of the book acknowledge the mixed blessing that change has brought to these people. Large, full-color photographs illustrate the narrative. The language is clear and the sentences are short without being choppy. Linda Greengrass, Bank Street College Library, New York City Copyright 1997 Reed Business Information, Inc."